The discovery of the Chauvet-Pont-d'Arc Caves in the French Ardèche in 1994, is considered one of the most significant prehistoric art sites in the history of the human species. Studies have shown that the anthropomorphic and animal motifs of exceptional aesthetic quality on the cave's walls were made more than 30,000 years ago, making them some of the oldest known artworks on the planet. They demonstrate a range of techniques including the skillful use of shading, combinations of paint and engraving, anatomical precision, as well as three-dimensionality and movement. Interestingly, human beings are almost absent from these pictures, indicating a sublime lack of self-awareness in this prehistoric artistry. Were these paintings made in a secular artistic spirit – or were they part of a religious ritual? Or are both these "artistic" and "religious" aspects subservient to something else —some third dimension that has been effaced by time and is beyond our imagination today? Humans and their innovations are in constant evolution. The stories we imagine carve future developments. The futuristic visions in the science fiction films from the past did indeed manifest. Technologies merge with our genes and the arrival of more advanced and intelligent beings is expected. While many classic tales might be seen as superstitious or surreal to our present day selves, these so called ‘tales’ were as real as our current set of ideologies, may it be religion, miracles, cyborgs, aliens, nations, and beliefs such like ‘free democracies’. Storytelling and imagination remain a crucial drive for the future of our society. Stories that have been passed on time and time again have evolved into the mortar that bonds cultures. These stories build a collective body of belief systems, customs, stereotypes, values and codes. Changes in the social and political fabric inspire new narratives drawn in the collective mind. From the beginning of belief systems, from Hinduism to Plato, it has been suggested that the world is an imaginary world of illusion, and some argue that the modern human already lives in an imaginary world or simulation. In an age where political and social imagination runs dry, the presented works in the exhibition ‘Karma Ltd. Extended’, puts the human gift of imagination in its centrefold, looking at alternative narratives about being in the now and near future of possibility. This exhibition delves into the work of selected artists who through the media of film, sculpture, sound, text and performance, mould new imaginations and invite viewers minds to travel to unseen destinations. Anouk De Clercq, a Belgian artist based in Berlin, is known for her mesmerizing black and white films that travel through space and time. Her work Thing (video, b/w, 16:9, stereo, BE/IT/FR, 2013, 18:00) takes you into the gaze of a fictional architect and his imaginary city. It is an architectural universe that ceaselessly reveals its own virtuality for it exists only as a nebula of points wherein the point of view wanders. The sound artist Scanner created the soundtrack for this work. Thing is about the dot, or more accurately, about the scale interplay between the dot and its multiplication and organization in the digital image and space. 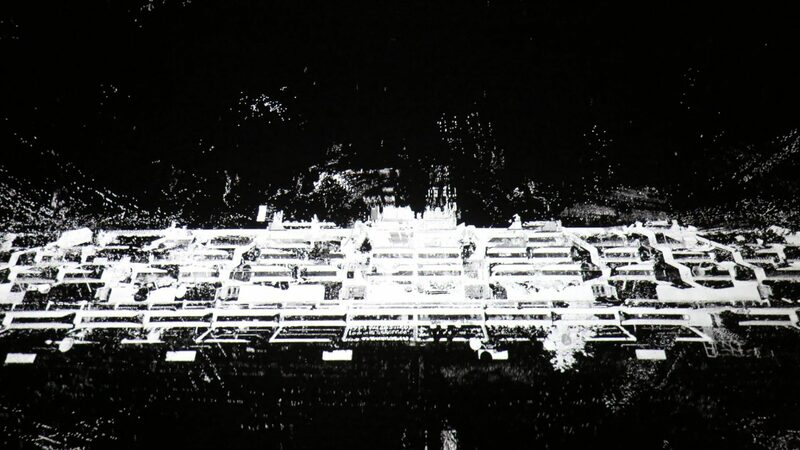 The technology used in Thing is made of 3D lunar scans of urban spaces. A tension is generated between the mechanical register of space and its embodied perception created from two sensing interfaces: the scanner and the body. Thing, is a film that is built from a text that progressively describes, creates, or builds a space. The dot and the word become thereby, parallel compositional elements. The dark and digital tension from Anouk Declercqs work shares a spatial poetry with Farkhondeh Shahroudi’s work, although Shahroudi’s work stands in contrast through its tactile and handcrafted nature. Shahroudi works with materials such as carpets, fabrics, hair, embroidery, and poetry to create anthropomorphic elements that come together to form creature-like sculptures. Her work expresses a sense of wonder into a parallel universum, which reveals the creative process of the imagination and the overturning of contents and established symbolism. For Shahroudi, her “space” par excellence is the carpet, deriving from the ancient symbolism of the oriental garden depicted in Persian carpets as a reflection of paradise. They have always been present in her work, from her first hybridizations with painting in the ‘90s. In the successive decades they have become “mobile gardens”_heterotopic spaces, able to challenge or neutralize all other spaces because they are endowed with another spatiality. Shahroudi crafted a new in-situ installation of existing and new works for this exhibition Karma Ltd. Extended at ACUD Galerie. In the courtyard of the ACUD Kunsthaus, Pedro Oliveira created an in-situ sound installation. Born in São Paulo, Pedro Oliveira is a researcher and artist in sound studies. Border Vocalities: 'das hätte nicht passieren dürfen' is a sound piece for a trio of immigrant voices, composed as an act of insolence towards speech and accent recognition technologies and their deployment within the migration industry. The work invites the audience to take part in the slow, ritualistic building of a speech corpus of performative translations: the fourteen-minute long composition is thought as a dialogue between denunciation and enunciation. The trio "talks back" to the machine first by repeating in opaque ways selected "elicitation cues" taken from official statements of the German Office for Migration and Refugees (BAMF); in a second moment, they read excerpts from anti- and decolonial poetry (in this piece by May Ayim, Mahmoud Darwish, and Frantz Fanon) which the audience is invited to decipher by reading the scores. The refrain "das hätte nicht passieren dürfen" is taken from the official statement of the BAMF regarding the disastrous case of neo-nazi German soldier Franco A., who managed to successfully infiltrate Germany's asylum-granting system. His case was later used by the German government to push for accent recognition technologies to tighten control over European borders. Viviana Druga (Transylvania/Berlin) is interested in feminine aesthetics and occult and ritual practices. In her work, she questions techniques of representation and plays with the different variations of performance art. For this exhibition, Druga has produced an installation entitled in absentia in which she plays with the presence and absence of the artist herself by inviting her alter-ego. Isabel Lewis offers an immersive experience. It’s hard to know what to call installations that you cannot only see, but also hear, feel, taste — even smell. The artist and choreographer Isabel Lewis — born in the Dominican Republic and now based in Berlin — calls them “occasions.” For the exhibition at ACUD, Lewis focuses specifically on two modalities of live composition: dance-making and music-making. notfoundyet is a Vienna based artist group founded in 2007, a collaboration between Laia Fabre & Thomas Kasebacher. Notfoundyet creates work that links audience members together and unifies them as part of a live event, building a temporary community. The artist duo explores the depths of human nature, while playing with the codes and language established by society. They present a new work entitled TROUBLE, that they have developed during their ACUD Artist Residency. This work explores the idea of "getting into trouble" as a positive opportunity. During the opening night on the 2nd of February, the visitors get the chance to know more about their artistic work and processes. Liam Young is an architect who operates in the spaces between design, fiction and futures. He is founder of the urban futures think tank Tomorrows Thoughts Today, a group whose work explores the possibilities of fantastic, perverse and imaginary urbanisms. Liam’s projects develop fictional speculations as critical instruments to survey the consequences of emerging environmental and technological futures. Die 1994 entdeckten Chauvet-Höhlen gehören zu den weltweit bedeutendsten archäologischen Fundorten prähistorischer Kunst. Laut Studien sind die anthropomorphen Holzkohlezeichnungen und Tiermotive, welche die Wände der Höhle bedecken, über 30.000 Jahre alt. Sie zählen zu den ältesten künstlerischen Zeugnissen seit Entstehung der Menschheitsgeschichte und offenbaren eine unermessliche Bandbreite künstlerischer Techniken und Stilmittel, wie die Kombination verschiedener Malfarben, Eingravierungen, anatomische Präzision, Dreidimensionalität und Bewegung. Bemerkenswerterweise enthalten die Malereien so gut wie keine menschlichen Protagonisten, was aus heutiger Perspektive äußerst ungewöhnlich scheint. Kann man sie als weltliche Kunstwerke im Sinne eines künstlerischen Selbstverständnisses deuten? Waren sie Teil eines heidnisch-religiösen Rituals? Oder verweisen sie eventuell auf einen anderen Ursprung, eine dritte Ebene, die jenseits unseres epochengebundenen Vorstellungsvermögens liegt? Der Mensch und seine Innovationen befinden sich in ständigem Wandel. Die Geschichten, die wir uns heute ausmalen, beeinflussen die Erzählungen der Zukunft. So haben sich etwa die futuristisch-absurden Visionen manch alter Science-Fiction-Filme als wahr herausgestellt - die Grenze von Technologie und Genen verschmelzen und die Existenz einer neuen, künstlichen Intelligenz scheint greifbar nah. Auch wenn uns heute viele klassische Erzählungen surreal oder abergläubisch erscheinen, müssen sie als genauso real wie unsere gegenwärtig existierenden Wertesysteme betrachtet werden – ganz gleich ob sie sich auf dem Glauben an Religionen, Wunder, Cyborgs, Nationen oder eine “freie Demokratie” gründen. Das Erzählen und Imaginieren von Geschichten ist bis heute eine der treibenden Kräfte in unserer Gesellschaft. Geschichten, die über Generationen hinweg erzählt und weitergereicht wurden, sind das Elixier, das die Gesellschaften zusammenhält. Diese Erzählungen bilden einen kollektiven Körper aus Glaubenssystemen, Bräuchen, Stereotypen, Werten und Codes. Sozialer und politischer Wandel inspiriert die neuen Narrative, die sich in das kollektive Gedächtnis einschreiben. Bemerkenswerterweise wird die Welt seit dem Entstehen erster Glaubenssysteme, wie dem Hinduismus oder der Ideenlehre Platons, als eine auf Vorstellungen beruhende Welt der Illusion beschrieben. In einer Gegenwart, in der das menschliche Vorstellungsvermögen an seine Grenzen stößt, stellt das erste Kapitel von Karma Ltd. Extended unter dem Titel “Vorstellungskraft” die Kraft der Imagination ins Zentrum, um nach alternativen Erzählungen in der Gegenwart und nahen Zukunft zu suchen. Im Fokus der Auseinandersetzung stehen Arbeiten von Künstlerinnen und Künstlern, welche die Medien Film, Sound, Skulptur, Text und Performance nutzten, um neue Vorstellungswelten zu imaginieren und die Besucher in noch unerforschte Bereiche zu entführen. Anouk De Clercq ist eine belgische Künstlerin, die in Berlin lebt und für ihre bestechenden schwarz-weiß Filme bekannt ist. Ihre Arbeit Thing (Video, s/w, 16:9, stereo, BE/IT/FR, 2013, 18:00) nimmt die Perspektive eines Architekten und seiner selbst entworfenen, imaginierten Stadt ein. Der Sound-Künstler Scanner hat den Soundtrack für diese Arbeit entworfen. Der Film entwickelt ein architektonisches Universum, das seine eigene Virtualität unablässig offenlegt und aus einem einzigen nebulösen Rastersystem besteht. Die Technologie, welche in Thing verwendet wird, beruht auf einem 3D-Lunar Scan des urbanen Raums. Im Verlauf des Films entsteht eine Spannung zwischen dem mechanischen Register des Raums und seiner verkörperlichten Wahrnehmung, die sich aus der Überlappung zwischen zwei sensorischen Interfaces ergibt: dem Scanner und dem Körper. Thing basiert auf einem progressiven Text, der beschreibt, kreiert, Raum entwirft. Der Rasterpunkt im Bild und das Wort bekommen dabei parallele Kompositionselemente. Die düstere, digital generierte Spannung der Filme von Anouk De Clercq, teilt ihren poetischen Umgang mit dem Raum mit Farkhondeh Shahroudi – auch wenn Shahroudis Installation durch ihre taktile und organische Struktur zunächst gegensätzlich scheint. Shahroudi arbeitet mit unterschiedlichen traditionsreichen Materialien sowie Medien, wie Teppichen, Haaren, Stickereien und Gedichten, die sie in amorphe Wesen und fantastische Objekte verwandelt, die einer stetigen anatomischen Transformation unterliegen. Ihre Installationen und Skulpturen entspringen einem grundlegenden Interesse an einer Art Paralleluniversum und sind vom kreativen Prozess der Vorstellungskraft und dem Verweben von Inhalt mit etabliertem Symbolismus geprägt. Der Ausgangspunkt von Farkhondeh Shahroudis künstlerischer Arbeit ist der Perserteppich, welcher dem altertümlichen Symbolismus orientalischer Gärten entspringt und das Paradies abbildet. Seit ihren ersten hybriden Malereiarbeiten, ist der Teppich in ihrem Werk präsent. In den vergangenen Dekaden sind die Werke zu “mobilen Gärten” geworden, welche andere Raumdimensionen sukzessive zu unterwandern und neutralisieren vermögen, da sie einem anderen Raumverständnis entspringen. In der Acud Galerie zeigt Shahroudi eine speziell für den Raum entwickelte Installation aus alten und neuen Arbeiten. Im Innenhof des Acud Kunsthauses präsentiert Pedro Oliveira (Brasilien/Berlin) seine ortsspezifische Soundinstallation Border Vocalities: das hätte nicht passieren dürfen: eine Soundarbeit, die für ein Stimmtrio von Immigranten entwickelt wurde und eine Entgegnung auf den Einsatz von Stimmbiometrie und Akzenterkennungstechnologien in der Flüchtlingsindustrie ist. Die Besucher werden sukzessive in einen sich langsam entfaltenden, 14-minütigen Textkorpus eingebunden. Die Komposition ist als Dialog zwischen Denunziation und gleichzeitiger Kundgebung angelegt, bei der das Stimmtrio die Äußerungen des Bundesamts für Migration und Flüchtlinge (BAMF) wiederholt. An späterer Stelle werden Auszüge aus Texten von Kolonialisierungsgegnern, wie May Ayim, Mahmoud Darwish und Frantz Fanon, verlesen, die auf den Notationen entziffert werden können. Der Refrain das hätte nicht passieren dürfen ist dem desaströsen Fall des rechtsextremen Bundeswehrsoldaten Franco A. entnommen, der sich unter falscher Identität selbst als Asylsuchender registrieren ließ und einer rechten Terrorzelle angehört. Der Vorfall wurde später von der Deutschen Regierung genutzt, um Akzenterkennungstechnologien an den europäischen Grenzen voran zu treiben. Oliveira ist ein in Berlin lebender Wissenschaftler und Sound-Künstler aus São Paolo und Teil der Künstlerkollektive A Parede (http://a-pare.de) und Decolonising Design (www.decolonisingdesign.com). Viviana Drugas Arbeiten nutzen die Medien Performance, Fotografie und Installation. Ihr besonderes künstlerisches Interesse gilt der Wiederbelebung weiblicher Ästhetik und alten Wissensformen wie okkulten und rituellen Praktiken, die auf heidnischen Bräuchen beruhen. In ihren Arbeiten erkundet sie Techniken der Repräsentation und spielt mit verschiedenen Variationen von Performance-Kunst. Für die Karma Ltd. Extended-Ausstellung entschloss sich Druga die Installation in absentia zu entwerfen, welche mit dem Präsenz-Absenzmoment der Künstlerin spielt und ihr skulpturales Alter-Ego einsetzt. Isabel Lewis entwickelt immersive, auf die Sinne fokussierende Installationen, welche die Grenzen zwischen Choreografie, Performancekunst und Ausstellungsarchitektur verschwimmen lassen. Die in der Dominikanischen Republik geborene und in Berlin lebende Lewis, nennt diese selbst “Occasions”. Für ihre Arbeit im ACUD konzentriert sich Lewis auf die besondere Verbindung zweier verschiedener Elemente von Live-Komposition – der des Tanzens und der des Musikmachens. Notfoundyet ist eine 2007 in Wien gegründetes Künstlerkollektiv, bestehend aus Laia Fabre und Thomas Kasebacher. In ihren Arbeiten vereint das Künstler-Duo das Publikum in komplexen Live-Events und schafft so ein gemeinschaftliches Erlebnis. Das Duo befindet welches sich seit einigen Monaten im Residency-Programm des ACUD Hauses, um dort an ihrem neuen Projekt Trouble zu arbeiten. Ihre Arbeiten können vor allem im skulpturellen und performativen Bereich verortet werden, wobei die inhaltliche Ausrichtung der Werke sich stark mit philosophischen Konzepten, als auch tagespolitischen Thematiken auseinandersetz. Im Zuge der Kollaboration zwischen den Künstlerkuratoren und dem kuratorischen Kollektiv Karma Ltd. Extended werden am Eröffnungsabend, dem 2. Februar 2018 - Studio Visits angeboten, in welchen die Besucher die Möglichkeit haben, mehr über die künstlerischen Strategien und Prozesse der beiden Wiener zu erfahren. Studio Visits werden nach vorheriger Anmeldung um 20:00, 21:00 und 22:00 Uhr angeboten. Liam Young ist ein Architekt, der sich in den Feldern spekulatives Design, Fiktion und Zukunftsforschung bewegt. Er ist Begründer des Think Tanks Tomorrows Thoughts Today: eine Gruppe aus Wissenschaftlern, Zukunftsforschern, Technikern und Science-Fiction Autoren, welche die Möglichkeiten fantastischer, gescheiterter und imaginärer Urbanismen untersucht. Youngs urbane Zukunftsforschung fragt nach den Konsequenzen ökologischen Raubbaus und technologischer Entwicklung.